Hello! I am not sure of this card. It kind of evolved along the way. For the Mix It Up Monday Challenge at STV, I was trying to create a scene using GKD stamps from The Northwoods 2 which I had never used. 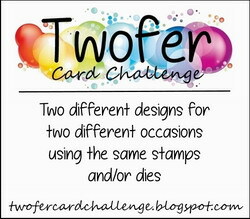 I stamped using Memento markers directly on the 2 images and stamped on white CS. I then stamped again using Versamark and heated with Clear EP. I then colored with markers and Copics but sponged the sky with Summer Sky ink. Added some birds in flight with stamps from Gifts from the Sea and some clouds cut with a die from watercolor paper. Trimmed the image and attached to a layer of white CS and a base of Grass Green CS. 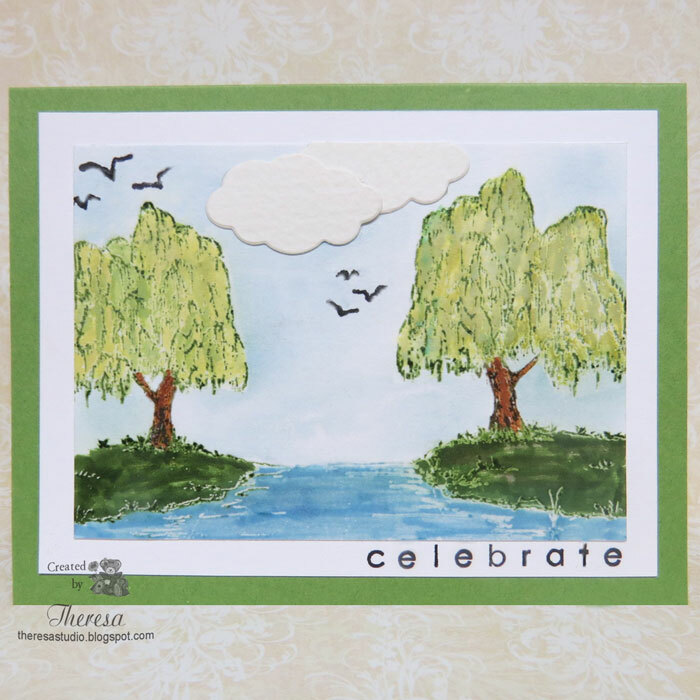 Stamped the word Celebrate from Beyond Baskets 2 set. 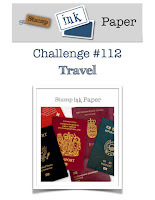 Stamp TV: Mix It Up Monday Challenge -create a scene with stamps. 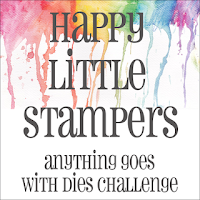 Addicted to Stamps and More: #257 Make your mark. Welcome! 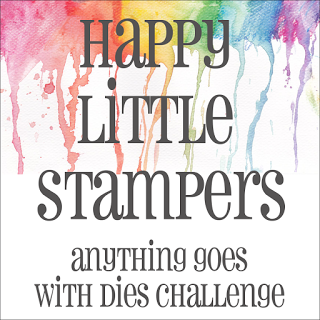 This card is for the Anything Goes Challenge A2317 at The House That Stamps Built. I used a Repeat Impressions small Butterfly stamp and Sentiment. 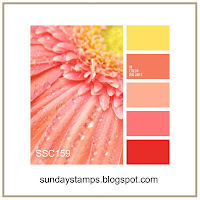 The images were stamped with Memento Tuxedo Black ink and Colored with Memento Cantaloupe, Dandelion, and Tangelo markers. 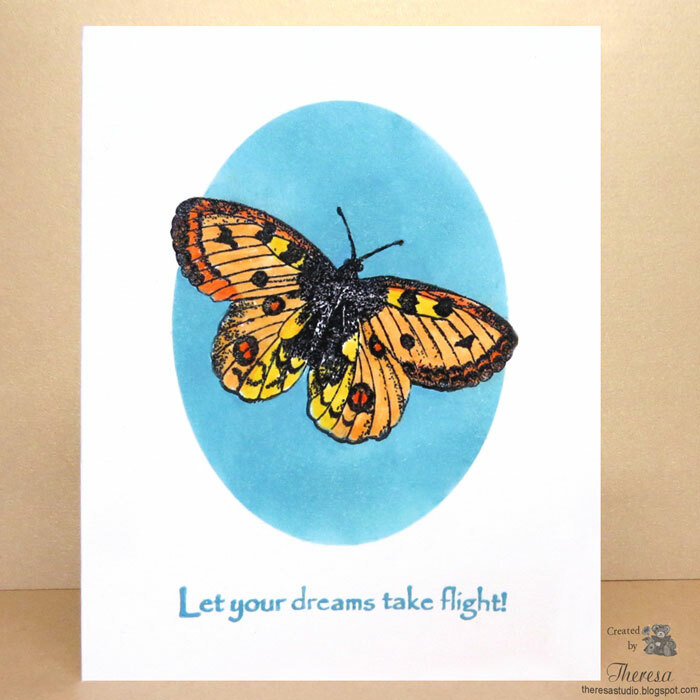 I used Distress Oxide inks Fossilized Amber, Wild Honey, and Spiced Marmalade to create the background on white CS. Added some distressing and Dew Drops to finish. Hello! 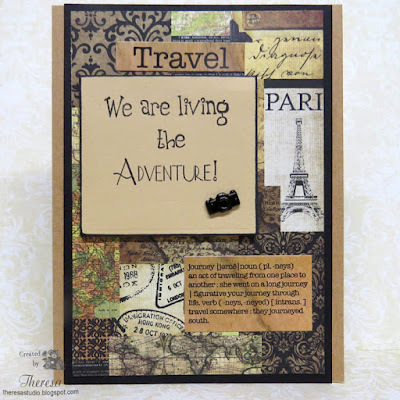 This one layer card was made using stamps and dies from Hero Arts August Kit. I stamped the girl in flight and cloud with Memento Tuxedo Black and heat embossed with Clear EP. I cut masks for the girl and cloud with dies. I also cut a mask with an oval die. Using the masks I sponged Distress Ink Faded Jeans and added "stars" with Pilot Metallic Silver marker. Finished with the Hero Arts sentiment in the same black ink. The card below was my first attempt at this design but I messed it up when I misted with Metallic Blueberry mist and the mist leaked under the mask and went beyond the oval. 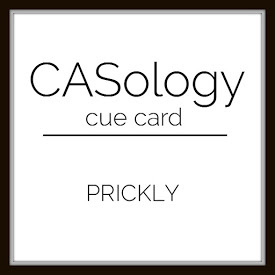 I saved the image by cutting an oval window in a card base of White CS and attached the image under the opening. Hello! It has been a while since I featured one of my many bear stamps on a card. This sketch from Tuesday Morning was perfect for this Penny Johnson stamp Bear Flowers. I stamped it on Ivory cardstock with Memento Espresso Truffle and colored with Copics. I trimmed the image with an oval die and placed on a layer of Shimmery Pink CS cut with a scallop oval die. Assembled the card with a Lacy Paper Doily from stash, a ShimmeryPink layer embossed with CB Polka Dots EF, and a card base of Ivory. Added Wine Satin Ribbon streamers with Die Cut Yellow flowers and a Tag (love). Used a Metallic Gold Gelly Pen to add some accents but they are hard to see in photo. As You Like It Challenge: Favorite Fur or Feathers-It's fur for me! I love my furry Teddy Bears (they melt my heart) and using my Bear stamps. Welcome! I just had to make a card with the cute Sheep stamp and die in the August Hero Arts kit. 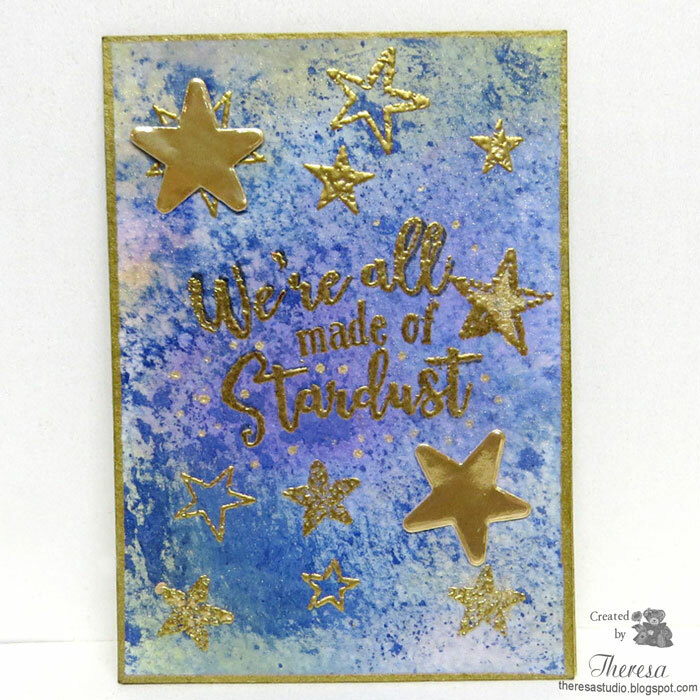 I made a Sky background inking a white CS panel with Distress Oxide Ink Faded Jeans and misted it with Metallic Blueberry Mist and Gold Shimmer Mist (from kit) and added dots and stars with a Pilot Metallic Silver marker. I stamped the sentiment Dreaming of You with Versamark and heat embossed with Wow Silver EP. 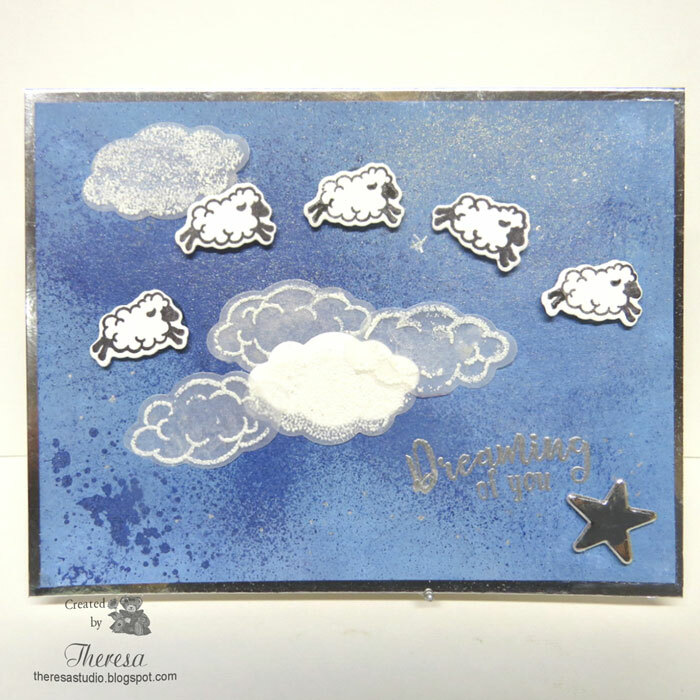 Stamped clouds on Vellum and heat embossed with White Puff EP and die cut. Stamped the 5 Sheep on white CS with Black ink and die cut. Attached them with pop-up Glue Dots to the background lauer. Attached to a Metallic (Mirror) Silver card base and finished with a single Star die cut from the same Metallic CS. This was a fun card to create and reminded me of the song "Counting Your Blessings". Listen to "Count Your Blessings" by clicking on the video below. 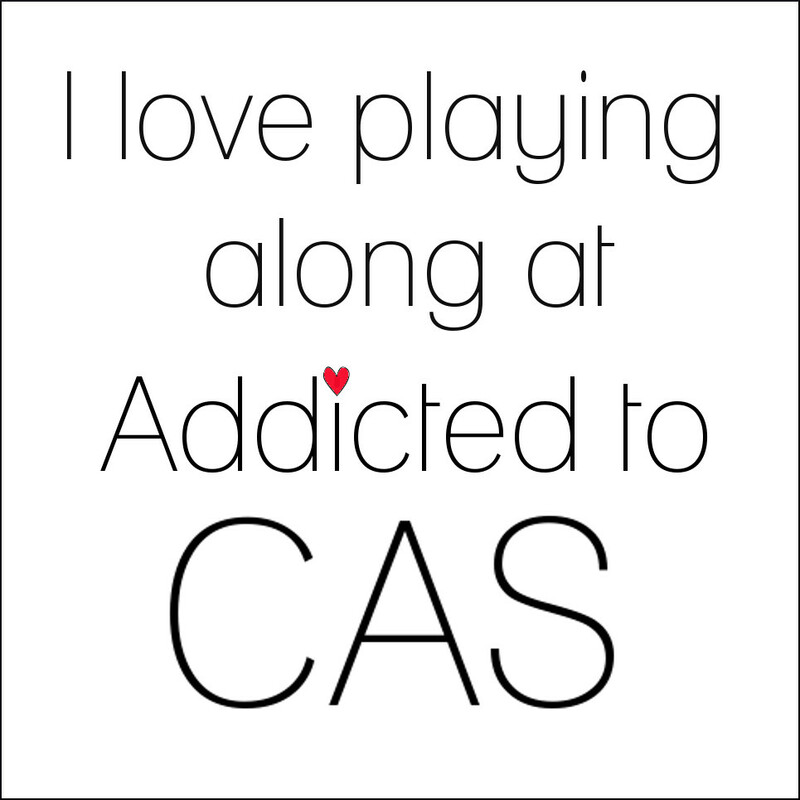 Must be on my blog to play. Hello! 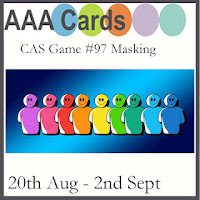 Today, I am showing an ATC (Artist Trading Card) that I made for the challenge at Simon Monday Challenge. 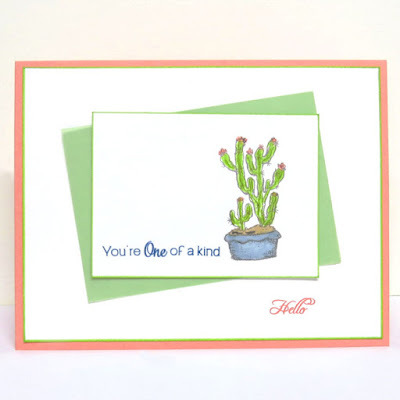 Artist trading cards (ATCs) are miniature pieces of art that are traded around the world. The only official rule for ATCs is the size: 2.5″ x 3.5″. I used stamps and die cuts from the August Hero Arts kit. 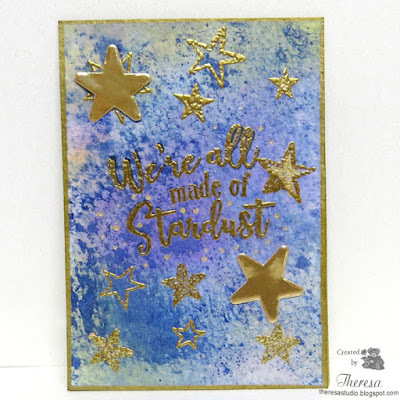 I made the background with several Distress Oxide inks sponged on watercolor paper and misted with Metallic Blueberry Mist and Gold Shimmer Mist. I stamped the sentiment and several stars with Versamark and heat embossed with Gold EP. I added 2 stars die cut from the liner of an envelope that I recycled. Used Pilot Gold Metallic marker to ink the edges. Hello! This card was made for the Mix It Up Monday Challenge at Stamp TV and other challenges. Cat at STV wants us to use two of the things on her list that correspond with the numbers of our birthday and make a card. 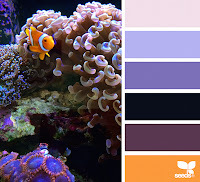 My birthday is June 18, so I have to use 1 - only one layer and 8 - butterfly. That's easy enough. I started with GKD White Heavyweight cardstock....perfect for a one layer card. I stamped the Butterfly from GKD Take Flight set in black ink and heat embossed with clear EP. I colored the image with Memento Markers Dandelion, Cantaloupe, and Tangelo. Using masks for the butterfly and one made with an oval die, I sponged an area with Distress Oxide Ink Broken China. The blue background really makes the colors of the butterfly pop. I finished by stamping a sentiment from the same set with the Broken China ink. 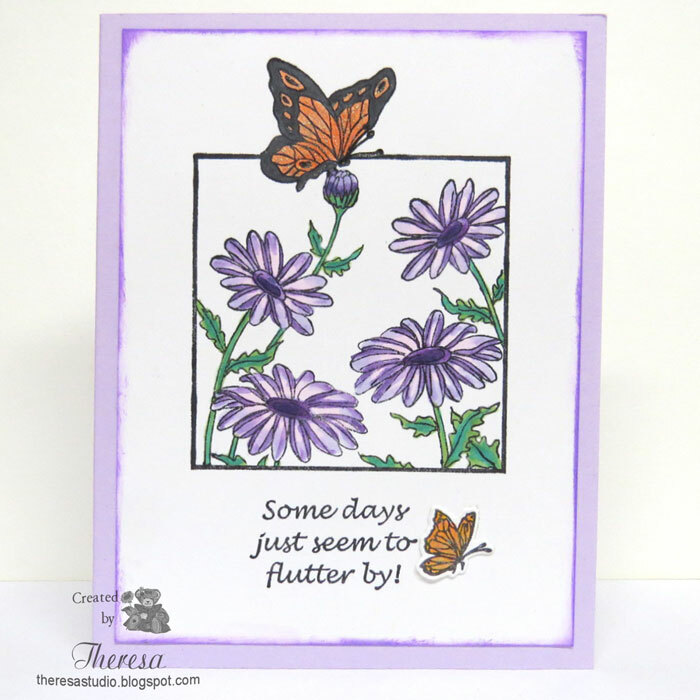 I am very pleased with my one layer card with the butterfly. Hello! Playing something new.....a digital challenge. 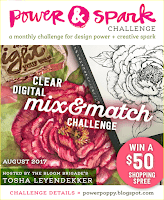 I found Digitally Made challenge blog which allows only digitally made projects. This week's Challenge #4 is Pets/Animals. 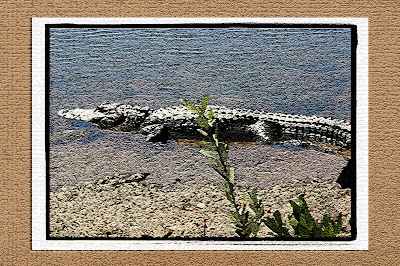 This is not a card but a project of a photo that I enhanced using Photoshop Elements. 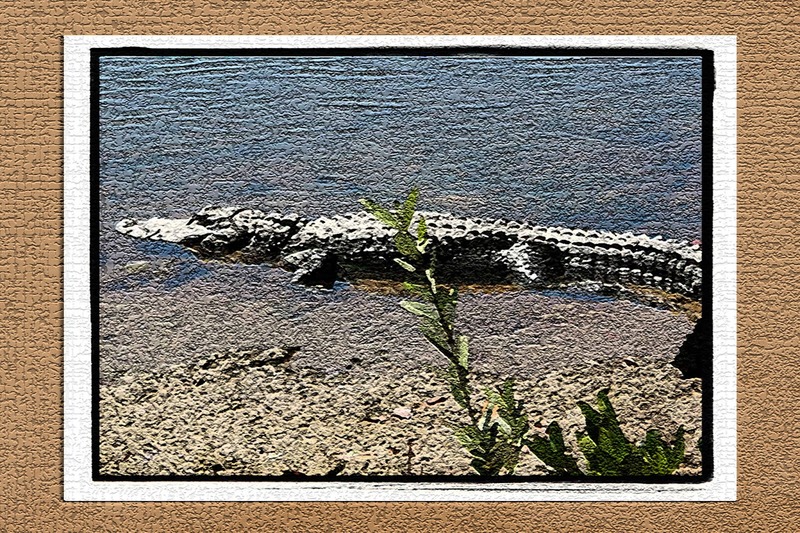 I began with a photo of an Alligator taken by my DH at Ding Darling Wildlife Reserve. I opened the photo in PSE and used an artistic filter to make it look like it was a watercolor painting. I then applied a theme of Old Style Paper, added a frame, and added texture with a Craquelure feature. 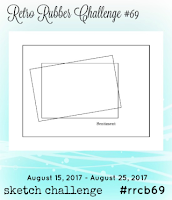 This is my first attempt at this kind of challenge and I have much to explore and learn. I like the final look.....might print and use in a frame or use as a desktop. This is the original photo that I used before any editing. Hello! 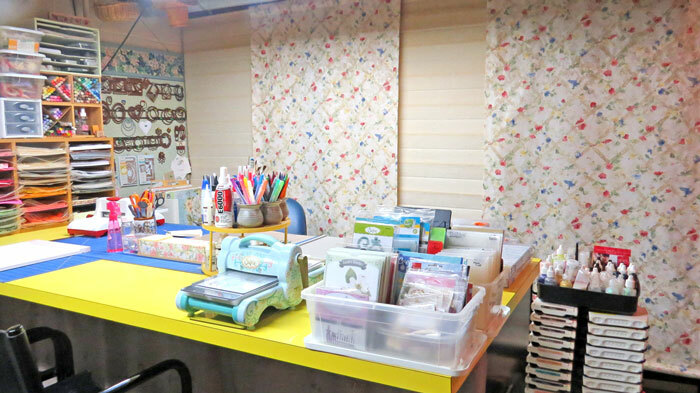 I have so much pattern paper and try to use it on cards when ever it inspires me. 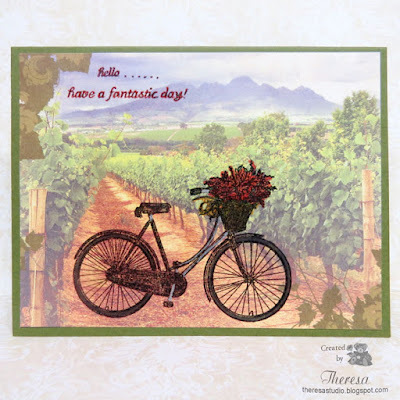 Trying to think of an idea to use a Bicycle stamp for a challenge to use Wheels, I pulled out a paper from Paper House At the Vineyard pad. I stamped the image directly on the paper with black ink and heat embossed with Clear EP. I colored in some spots with Copics and Silver Pilot Marker on the bike. Simply trimmed the paper, stamped the sentiments, and added to a Card Base of GKD Fresh Asparagus CS. Stamps all from Paper & Such set Basketful of Flowers. Love the scene with the Bicycle. Hello! 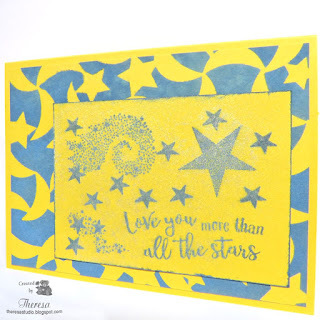 I have another card that I made with the August Hero Arts kit using the stencil of Moon and Stars with several of the Stamps. 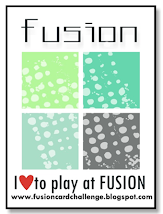 I ended up using only 2 colors for the design. I used the Stencil with Distress Oxide ink Faded Jeans on Yellow CS. I trimmed this to fit on a card base of the same Yellow CS. 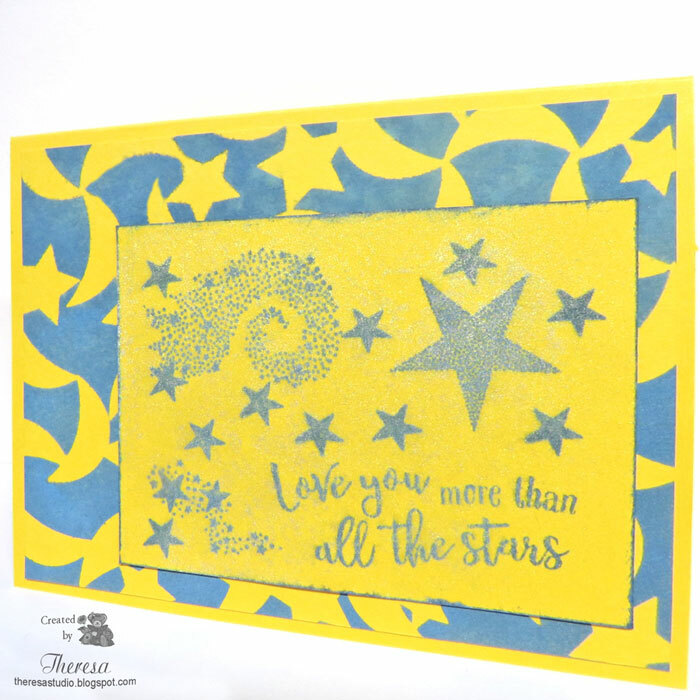 I stamped Stars, Sentiment and more with the same ink on a smaller panel of the Yellow CS (misted this with Gold Shimmer mist) and attached off center on the stenciled layer. 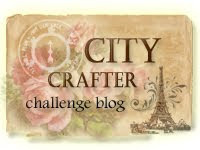 City Crafter Challenge: Week 375 or 377 You Don't Bring Me Flowers. 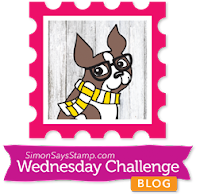 Simon Wednesday Challenge: Simon says Add a Sentiment. Welcome! 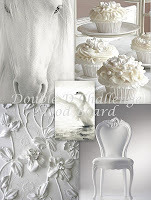 I am sharing a Christmas card that I made for It's All White challenge at Double D Challenge. 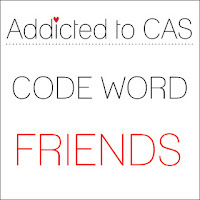 I used 3 different white papers-Glossy CS, Neenah white CS, and Off White CS. I used dies from Partridge in a Pear Tree (free gift) and Spellbinders Royal Frame . Added a ribbon of White Satin with Flocked Dots and White Enamel Dots. Sentiment from Gina K Designs Peace and Joy set and inked with Memento Tuxedo Black. 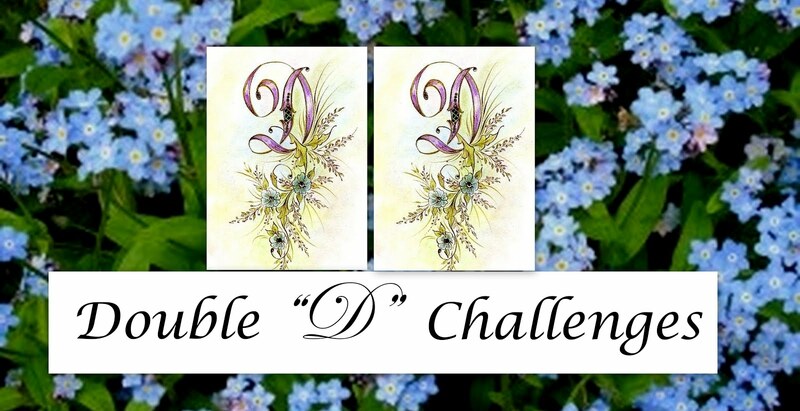 Double D Challenges: All White. 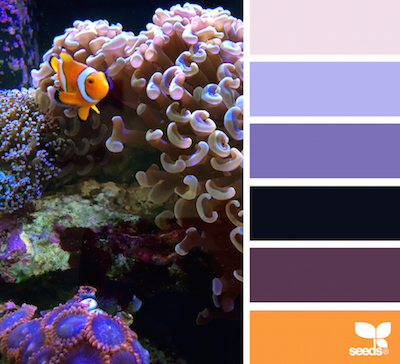 Mood board below. Hello! It's never too early to make Christmas cards and I decided to make this one with some Power Poppy stamps...both clear and digital ones. 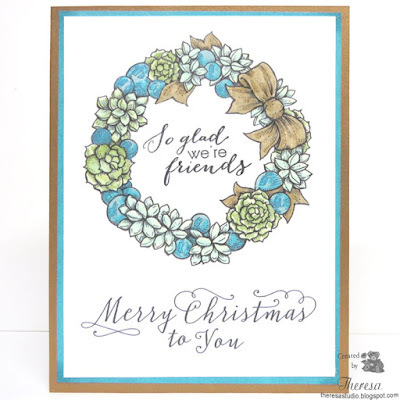 I printed the wreath from Wreath Succulent & Baubles digital stamps and the Merry Christmas sentiment from Chickadee In Barberry digitals on White CS. 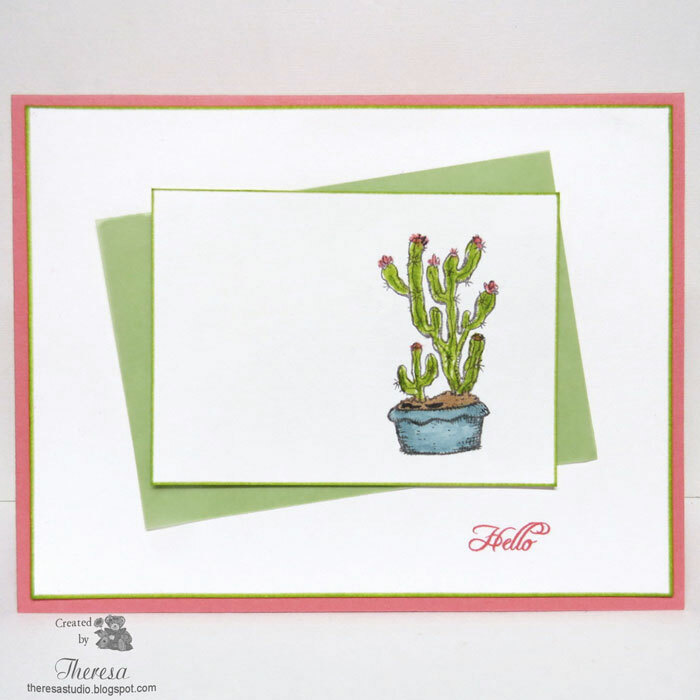 To make this a special Christmas card for a friend, I stamped the friends sentiment from Sassy Succulents clear stamp set with Memento Tuxedo Black ink. I colored the wreath with Copics G000, G20, G82, BG11, BG05, BG72, and Y28 and added some sparkle and shine with Wink of Stella and Clearstar Pen. I used a Gold Simmer Metallic CS for the base and a layer of White CS that I colored the edges with Copics to coordinate with colors in the wreath. 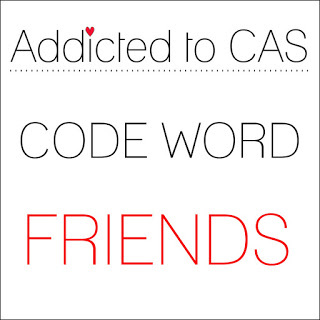 This is a quick way to have a coordinating CS that is a perfect match. 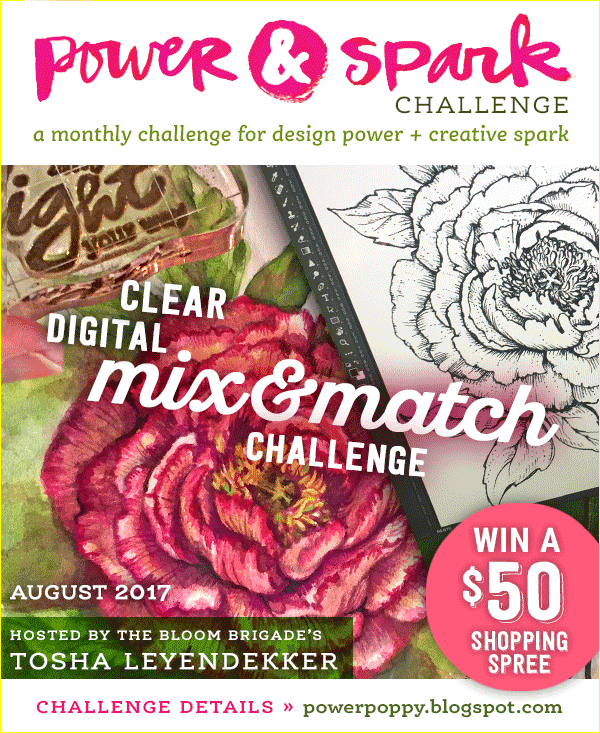 Power & Spark Challenge: August Mix and Match Challenge-combine ANY KIND of Power Poppy stamp sets: Clear with Clear, Digital with Digital, or if you’re really feeling adventurous...Clear with Digital. I used 2 digital stamps from 2 different sets Wreath Succulent & Baubles and Chickadee In Barberry and 1 clear stamp from Sassy Succulents. Hello! Playing with some old pattern paper and some other items from my stash to create this card with a Travel theme. 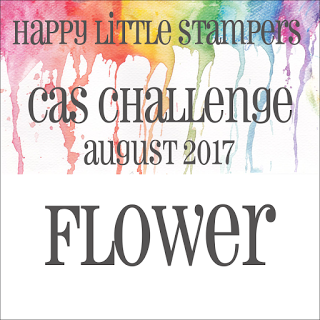 The pattern paper by Teresa Collins was a great place to start and I added some stickers from Creative Imagination and a sentiment from my stash of stamps. I stamped the words on a scrap of tan CS with Memento Tuxedo black ink and inked the edge with black. Added a Brad Camera that I have had (hoarded) for years waiting for the right card to use. Used a Kraft card base and a Black mat to assemble the card. 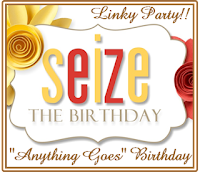 Like the collage look of the finished card. 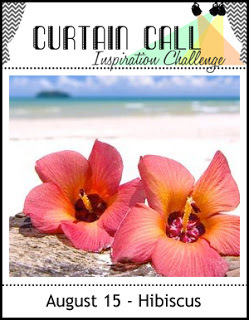 As You Like It Challenge: Theme is to showcase a project using your Favorite Embellishment (& why). I love Brads especially special ones like the Camera on my card. They give such a individual and personal touch. Hello! 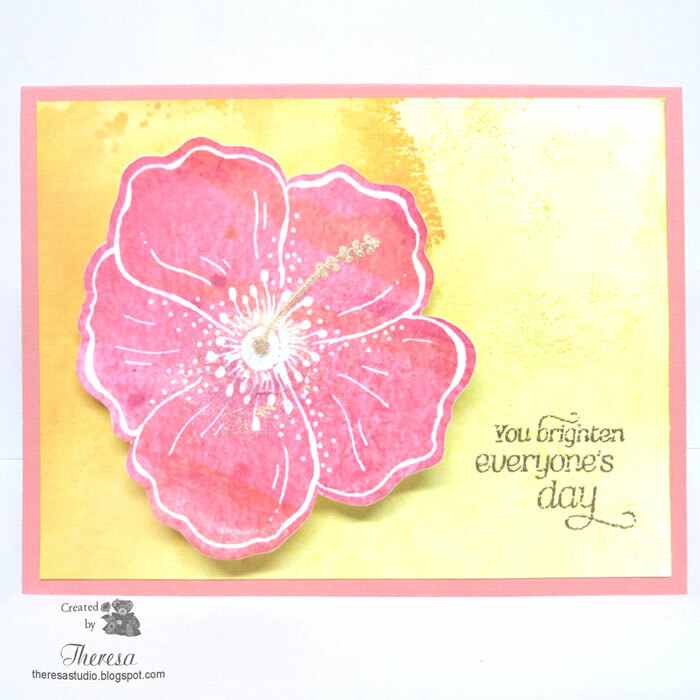 I have another card made with a Print and Cut file of a Hibiscus from Silhouette Studio that I printed and cut with my Cameo. Attached the flower to a background inked with Distress Oxide inks Peeled Paint, Fossilized Amber and Spiced Marmalade . Used a card base of Orange CS. I did add a bit of Spiced Marmalade ink to the flower. 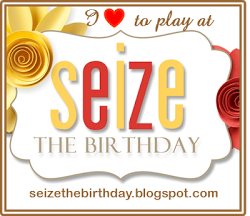 I heat embossed the GKD Birthday Wishes sentiment and the stamens with Copper EP. 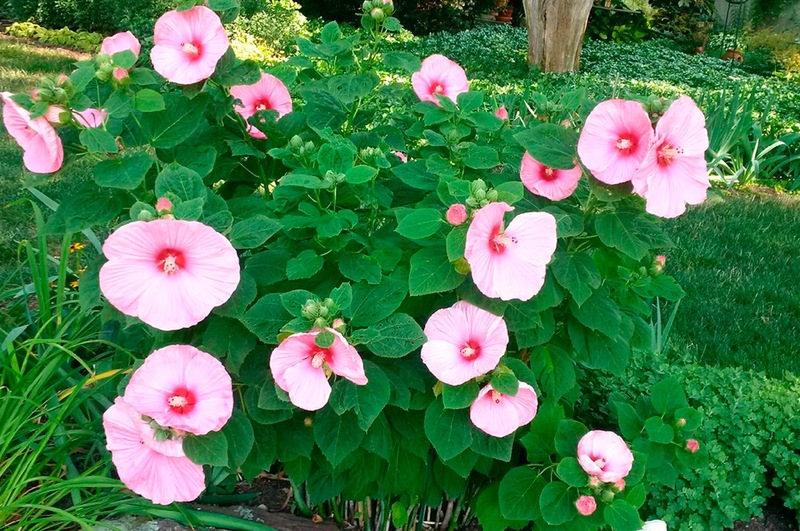 Love the swirly design of this Hibiscus. 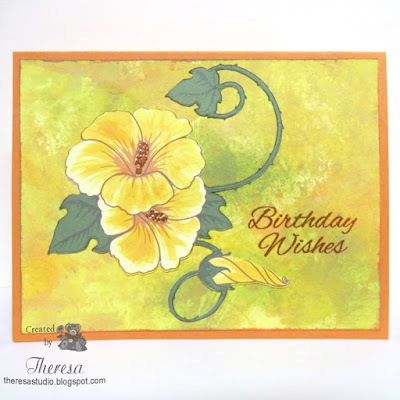 For fun I am sharing some cards that I made using our photos of Hibiscus from my garden. Welcome! 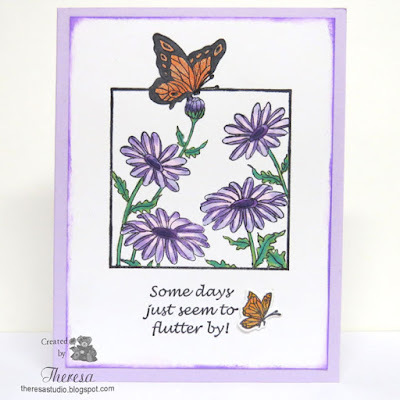 My card today features Repeat Impressions Daisies and Butterfly and a sentiment stamp that I inked with Memento Tuxedo Black on White CS and colored with assorted Copics using colors from the Inspiration Palette from The House That Stamps Built. I inked the edge of the image with DI Wilted Violet and attached to Lavender CS. I added a smaller Hero Arts butterfly stamped, colored and die cut. Addicted to Stamps and More: Challenge #255 Photo Inspiration. 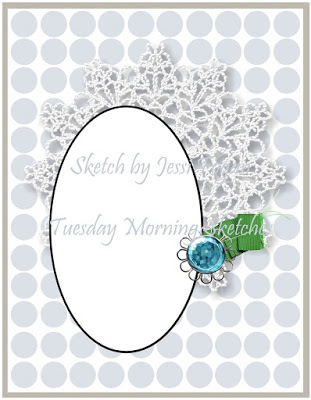 I was inspired by the shape of the petals to use daisy stamp. Cards In Envy: Challenge Bug Me! Hello! I really like this Happy Hibiscus card! 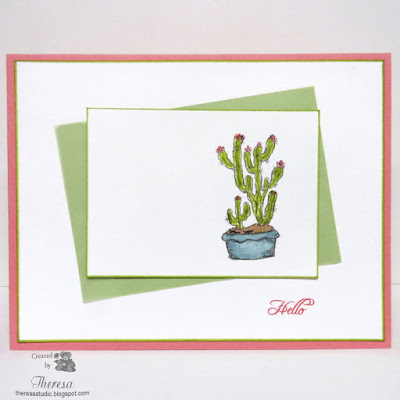 The card was made with a Print and Cut file from Silhouette Studio that I printed and cut with my Cameo. Attached the flower with foam tape to a background inked with Distress Oxide inks Fossilized Amber and Spiced Marmalade and then a card base of Coral CS. Added a stamen with Metallic pen and stamped a Power Poppy sentiment with Versamrk and heat embossed with Gold EP. Misted the background and flower with Gold Shimmer Mist. Shows better in real life than in photo. 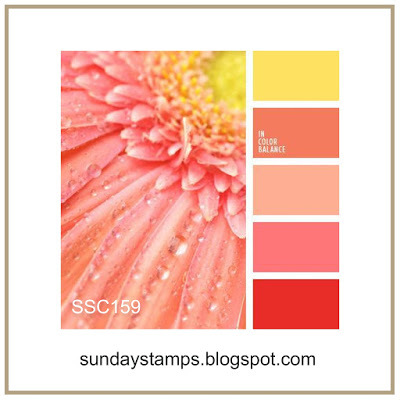 Sunday Stamps: SSC159 Summer Petals- Color Challenge- use a minimum of 3 colors from the graphic below, plus you may also use a neutral of your choice. Hello! I have 2 versions of the same card. I made the top one first but decided it looked a bit too empty when I took the photo and so changed it by adding another verse to the second one. Which do you prefer? 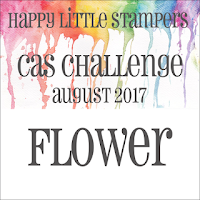 I used stamps from Power Poppy Hens & Chicks (2016) and the Hello stamp from Flourishes Cherry Blossoms (2012). Used Copic and Memento Markers and SU Cameo Coral and Blues and Memento Espresso Truffle and Pear Tart inks for stamping and coloring. Papers are White CS, Cooral CS, and Green Vellum. Inked edges of Paper with Memento Pear Tart ink. 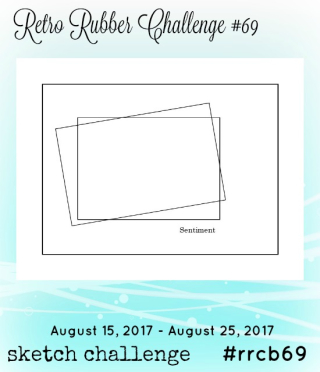 Retro Rubber: Challenge #rrcb69 Sketch below. Hello stamp from 2012 and others from 2016.